Nothing can be more frustrating than having your keys locked inside of your car. Especially when you’re running late. Fortunately in today’s world of technology, locking your keys in the car is an issue of the past. Nevertheless, there are precautions you can take to stop this critical and distressful situation. You should have a duplicate key. Duplicate keys are always worthwhile to have on hand. Entrusting a copy with a family member or friend staying nearby is a smart idea. You can also keep a duplicate key hidden somewhere around your home with your car and house keys, in the event of emergencies. The magnetic key case is a good place to keep them too. A common way to keep safe a duplicate key within your reach is to get a magnetic key case; it is cost-effective. As the name implies, they are magnetic and connect to the metal or steel car frame. You should hide the key cases in hard-to-reach areas, like beneath the fender. They are heavy-duty, rust-free cases that should withstand pressure, wear or damage. Some cars have door keypads placed underneath the handle. The codes could be personalized for you. This is a fantastic option made available for most car models that guarantee the driver is never locked outside their car again. Cars these days come with keyless controllers that can lock, unlock and even start the vehicle from the comfort of your home. While these accessories may look expensive, its worth the stress-free relief. It is also wise that every driver should subscribe to a roadside assistance service. There are endless options you can choose from. Some companies have additional fees while others may be free with the basic membership. This will save you from unnecessary frustration. 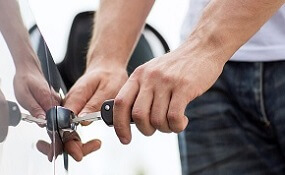 Having a locksmith, you trust can help you out of situations where you accidentally lock your keys inside of your car. Most companies have a 24 hours assistance while some others have office hours. 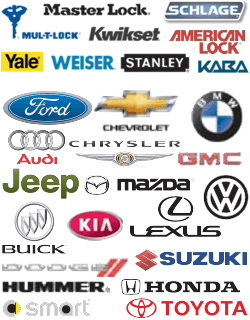 Hiring an automotive locksmith is the easiest way to get car key replacement. This could be a wallet-friendly option for someone who has locked themselves out but who are not in a hurry. The last resort might be to break-in through the door or window if it’s worth it. You could get a slim jim, a thin metal lock pick tool that works by tampering with the rods and levers that operate the door. One end of the slim-jim is narrowed into the car between the surrounding rubber seal and the car, inadvertently maneuvering the locking system of the car. What To Do When You Lock Your Keys In Your Car http://713locksmith.com/lock-keys-car/ 4.3/5 based upon 7 reviews.